Sport-locker.net can only think that Nike were inspired by Batman when deciding to promote their latest running shoes using a giant city projection. More than 100 international guests flocked to Berlin for the launch of the latest running shoe innovation – the Nike Flyknit Lunar2 – and to take part in an exclusive trial run through the wintry German capital. 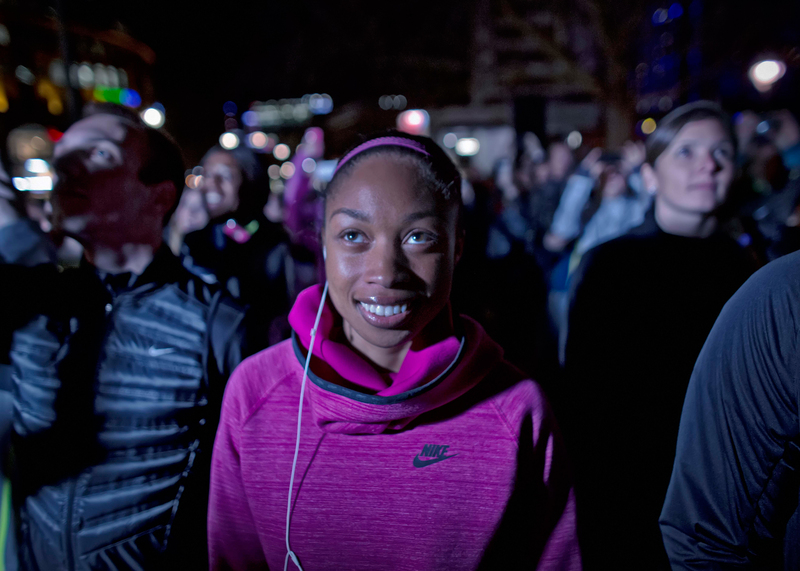 Special guest and four-time Olympic gold medalist Allyson Felix was on hand to present the cutting-edge footwear at the new NIKE BERLIN store, which will open its doors at Europa Center on February 14. The visual highlight of the event followed in the evening, when Felix started the countdown to activate a larger-than-life projection on Berlin’s famous Europa Center. 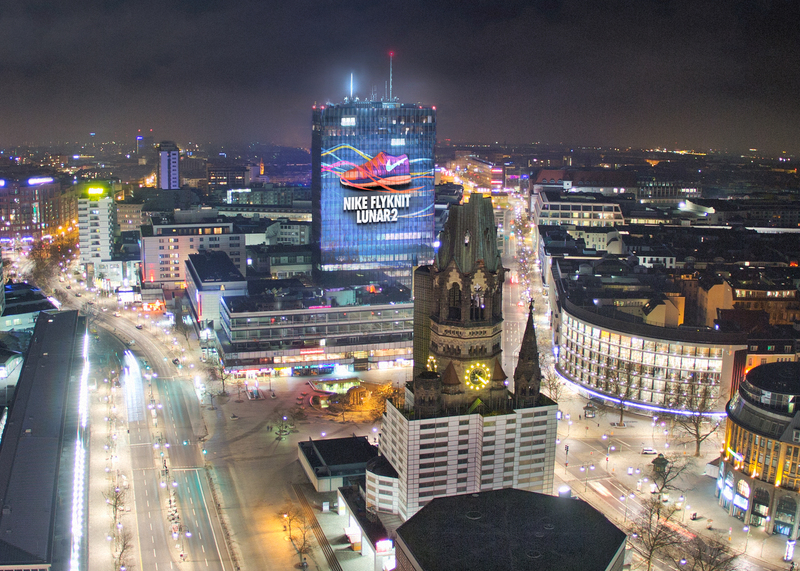 For minutes, Berlin was illuminated by the new Nike Flyknit Lunar2. After a dazzling laser show, the guests had the chance to put the new shoe through its paces on one of the city’s most popular running paths. After passing by the Brandenburg Gate, the Bundestag, and the Victory Column, the hardiest contestants braved all 21 floors of the Europa Center. Their just reward was reaching the after-run party some 300 feet above street level for an unforgettable view of Berlin by night. 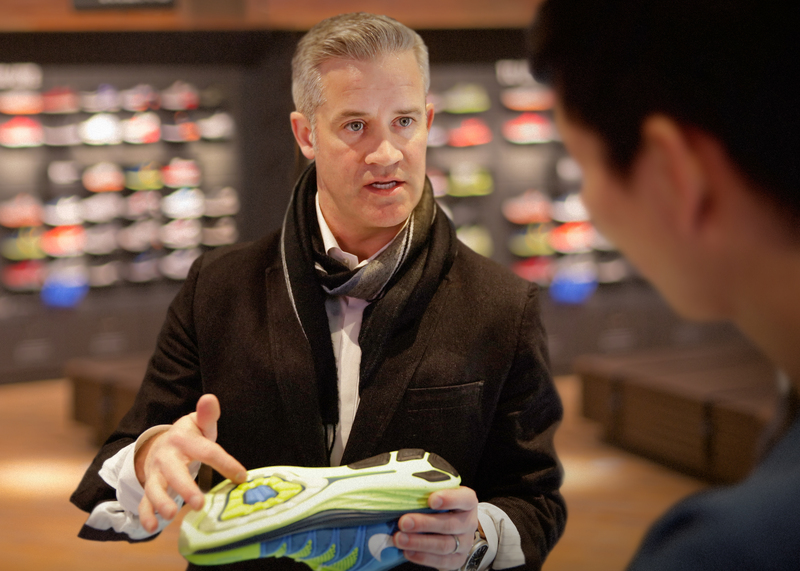 Nike Running creative director Sean McDowell offered exciting insights into the design and technology behind the Nike Flyknit Lunar2. “The Nike Flyknit Lunar2 integrates two of our most innovative technologies, Lunarlon and Flyknit. This combination gives you a soft, responsive and fluid ride,” McDowell explains. The Nike Flyknit Lunar2 is available now in stores and at http://www.nike.com for a suggested retail price of €159.95. What do you think of the Nike Flyknit Lunar2? Let us know in the comments section below or on our Twitter and Facebook pages.